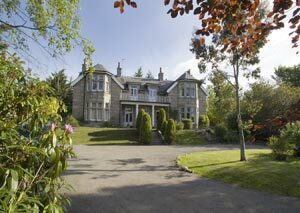 Tigh na Geald (pronounced Tie na Geeld) is a traditional Victorian villa set back from the road and surrounded by garden with a view over Aboyne Green to the pine-forested hills on the other bank of the River Dee. 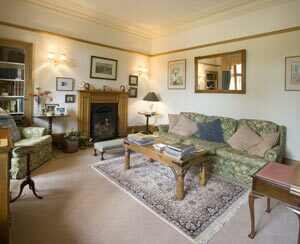 It is the family home of Julia and Kit Chambers who welcome guests to stay for bed and breakfast. Aboyne is an attractive historic village in the heart of Royal Deeside and on the edge of the Cairngorm National Park. It is ideal base for touring, visiting the Castles (eg Balmoral, Craigievar), golf, fishing, walking, cycling, and, notably for gliding enthusiasts, gliding from the popular airfield just outside the village. Julia has lots of local knowledge - a boon for travellers: the best places to eat, how long it takes to get somewhere and her own recommendations of special places to visit. 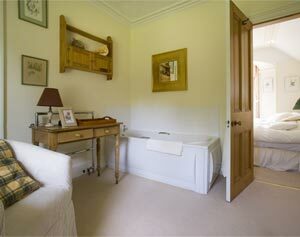 Double bedroom with Bathroom en suite. 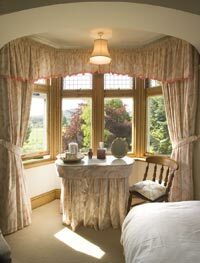 Both bedrooms have alcoves with views over the front garden and Aboyne Green. 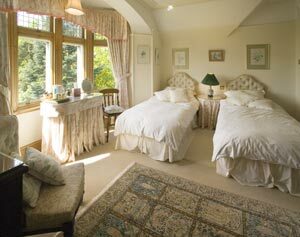 Twin Bedroom (beds can be joined to make a double) with Bathroom en suite. 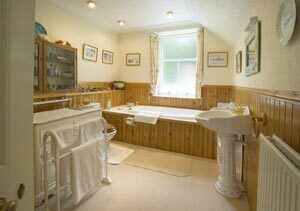 There is also a separate shower-room. 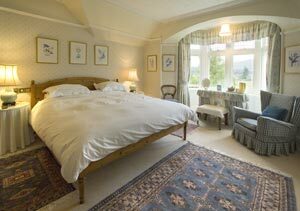 A further bedroom is sometimes available. Morning sun. The dining table laid for breakfast. Julia makes a delicious Scottish breakfast - eggs (free range) cooked as you like, sausages, bacon, tomatoes and mushrooms. Toast and marmalade and preserves, Yoghurt and cereal. Fresh coffee and tea. Particular dietary requirement can be catered with advance notice. 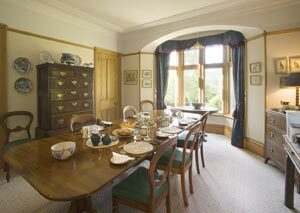 £45 per person per night (or £90 for the room), and includes a full Scottish breakfast, tea on arrival, etc. You are welcome to use the downstairs Sitting Room. There is Wi-Fi internet broad band throughout the house. Please tell Julia you found Tigh na Geald through About Scotland! 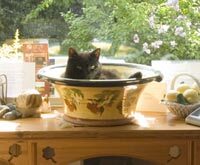 Eilidh resting in his special terracotta sleeping bowl. Below; Aboyne Green in front of the house. Aboyne Highland Games are held here usually in the first week of August: Heavyweight and Light Events, Stone, Hammer and Caber, Highland Dancing, Hill Race, Tug-o-War, Piobaireachd and Massed Pipe Bands.